Bengaluru, 8th February 2018: Bata, the European footwear major and India’s leading footwear brand announced its association with Smriti Mandhana, the opening batsman of Indian Women’s Cricket Team. Currently on the tour of South Africa as the Vice-Captain of the ODI squad, Smriti will be the new face of POWER – the preferred sport wear brand for Indians of all ages. The 21-year old Mandhana, is a role model for next gen Indians being young, strong and chic herself. She is among the most sought-after female sports personalities in the country, with a huge fan base. The turning point of her career was her memorable knock at the ICC Women’s World Cup 2017 which not only helped her win accolades but also the love of a proud nation. She personifies confidence and possesses a very pleasing personality. That coupled with her ability to change the game, is what led Bata to identify her as the perfect fit for POWER. Launched in 1971, POWER is the international sport wear brand from Bata. It is designed in Canada, and sold all over the world. Style, Technology, Comfort and Durability are the key qualities found in every Power Athletic shoe. Runners, team players, fitness enthusiasts, recreational athletes and adventurers who demand technically advanced footwear with superior quality and value can put their trust in Power. Starting this month, Smriti Mandhana will be seen promoting Power’s latest range - XO Rise - Running shoes with 25% More Rebound and Glide Vapour – sock-fit lightweight Walking shoes with memory foam for added comfort. These new and exciting collections will be available across Bata stores, starting INR 2499. “I have been playing and loving cricket from a very young age. However even till date every day is a new game. In the sense that there is a new challenge and along with it a fresh opportunity of achieving new milestone. When I was approached for POWER, the first thing that clicked was their vision to enable more and more young Indians onto a path of fitness. Any brand that fuels an active lifestyle in today’s world and helps people to overcome their inertia to start on a personal path to fitness, is a brand that I would love to partner with. 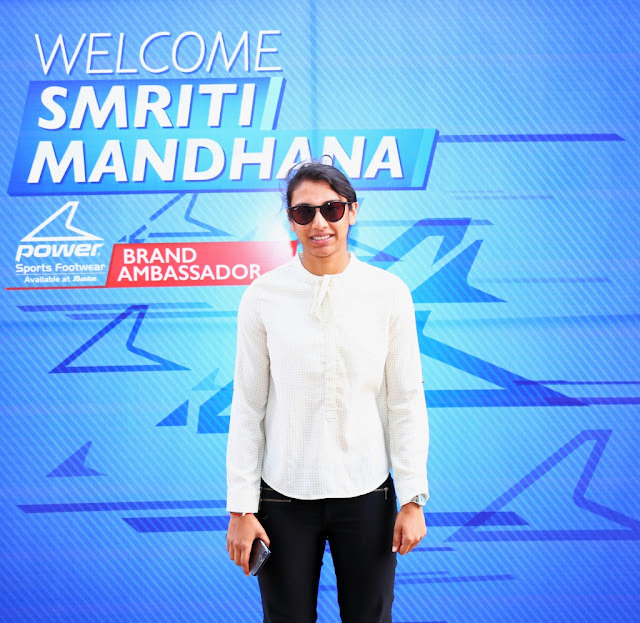 It is a great privilege to be the brand ambassador for POWER as it truly reflects my personal style and values.” said Mandhana, on her association with Bata. This association propels POWER further among its young and active target audience, most of whom are inspired by Mandhana’s hardworking and fit lifestyle. Smriti Mandhana is managed exclusively by India’s leading sports marketing firm, Baseline Ventures. Bata has held a unique place in the hearts of Indians for more than 85 years. Probably the only footwear brand that offers footwear and accessories for the entire family, Bata has redefined the modern footwear industry in India. It has established a leadership position in the industry and is the most trusted name in branded footwear. It sells over 50 million pairs of footwear every year and serves to over 120,000 customers almost every day. Bata India is the largest footwear retailer in India, offering footwear, accessories and bags across brands like Bata, Hush Puppies, Naturalizer, Power, Marie Claire, Weinbrenner, North Star, Scholl, Bata Comfit and Bubblegummers to name a few. It retails in over 1,290 Bata stores, on bata.in and in thousands of multi-brand footwear dealer stores pan-India.